On July 8, 1852, a fire engulfed and destroyed almost half of Montreal's housing. When it was over, 1,200 buildings had been destroyed and 10,000 people were left homeless - a fifth of Montreal's population at the time. The fire started at Brown’s Tavern on Saint-Laurent Boulevard and spread to the wooden houses built nearby. In The Gazette of July 10, 1852, a journalist wrote: “Within half an hour, a hundred houses were on fire. They were generally the dwellings of poor artisans and labourers, and it was a heart-rending spectacle to see the poor people gathering their few household goods together and carrying them to a place where the fire would reach them a few minutes after.” Despite the devastating loss of property, no deaths were reported. The Saint-Jacques Cathedral and the diocesan building attached to it, on the corner of Saint-Denis and Saint-Catherine Streets, constructed around 1822, were also destroyed. The cathedral has been reconstructed and destroyed several times since. Today, since 1973, the facade with its spire, built in 1876, which is considered a historical monument, is integrated into the Université du Québec à Montréal (UQAM). The Théâtre Royal, also known as the Royal-Hays, in existence from 1847 to 1952, is represented in the background of our painting, facing us. The Hayes House mentioned in the title was the name of one of the finest hotels in Montreal - it is the building on fire on the right. Both were located on Dalhousie Square, where James Duncan shows the people gathering their belongings, as well as the soldiers and volunteers helping them. The Dalhousie Square we see here does not exist any more - only a tiny road, Dalhousie Street, keeps the memory of the name, given in honour of General George Ramsay, the ninth Earl of Dalhousie, governor general of British North America from 1820 to 1828. During the fire, the volunteer firemen and soldiers worked hard and succeeded in saving some important buildings, such as the Notre-Dame Church and Montreal General Hospital, then situated on Dorchester Street. 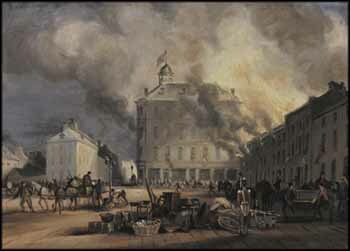 Nevertheless, the Great Fire of 1852 was one of the greatest catastrophes endured by Montreal in its history. Duncan was born in Northern Ireland and immigrated to Canada in 1825. He was a professional artist and teacher of drawing. By 1831, John Samuel McCord, the father of the McCord Museum's founder, had already commissioned Duncan to paint views of the Montreal region. The McCord collection contains numerous examples of Duncan's work. These paintings are an invaluable resource as they depict Montreal between the years of 1831 and 1878, when it was expanding rapidly. But more relevant to our subject matter, the McCord Museum holds a larger oil on board in its collection entitled Burning of Hayes House, Dalhousie Square, Montreal, a slightly different version of our painting, as well as a print done after the painting, around 1900. Both works were donated by the founder of the museum, David Ross McCord. The differences between the two paintings are minimal - for instance, in the McCord painting, the snowshoes in the foreground of our painting are now on the left, and the chest held by two individuals on the right in this painting has become a sofa. In each work, there are differences in some of the items piled in the square. We do not know which painting came first, this work or the McCord Museum painting, but what we do know is that both works are fascinating, and could be described as "the" paintings on the 1852 fire in Montreal. This work is accompanied by a photograph certificate from Galerie Walter Klinkhoff Inc. signed by Walter Klinkhoff, Montreal, January 17, 1975.